I fell in love with my garden again. I should say "gardens," plural, because in our case the entire lot is something other than lawn. To wit, several garden areas made up mostly of plants native to this part of the country or nearby. The only grass I mow is on the edges of the lot and actually belongs to the city. I started this project after our first major renovation in which a dilapidated detached garage was removed, a deck and bathroom built over a carport and shed off the back of the house, and fencing installed around most of the perimeter. By the time the builders were done, what was once the back lawn was nothing but dirt and rocks. It looked like a war zone. Side garden 2005. Flowering currant, turf grass, no trees. We thought about renting one of those tiny graders, but we never did. Instead, we slowly rehabilitated the back of the lot, regrading manually as we did so. We also slowly and painfully removed the turf from the side and front of the lot. Instead of grass, I planted native trees, shrubs, herbaceous perennials, and ground covers. I built a stone walkway through the side garden and some dirt paths in the back. Because we did not have a natural spot for a rock garden, I piled some of the nastiest mess into the middle of the back garden and covered it with soil and rocks, creating a mound. I reserved one area in what I thought was a sunny corner for a vegetable garden. Not only are native plants suited to the climate; they are also suited to the rather acidic soil that we have here. Except for the vegetable garden, I never brought any soil into these gardens. As well, the gardens are xerescaped, meaning that once a plant becomes established, it should no longer need watering. And if it does need watering, it might not have been correctly sited. I've lost a few plants along the way because they just weren't right for the spot where I planted them. Now, after 10 years, we have gardens that to a large extent maintain themselves. We have small-ish trees such as Pacific dogwood, black hawthorne, vine maple, and paper birch. We have shrubs small and large like the beautiful ocean spray, mock orange, black twinberry, salmonberry, yellow flowering currant, and snowberry. We have a few varieties of fern and several low-growing perennials such as vanilla leaf, false Solomon's seal, wild ginger, yellow violet, a few species of penstemon, and two kinds of wild strawberry. We also have lots of birds, bees, squirrels, and snails, and seemingly a healthy ecosystem in the soil. Self-maintaining to a large extent, but not entirely. In the autumn and winter, we do some cleanup, mostly removing dead leaves and trimming off flower stalks. I also get out my trusty hedge trimmer. Some of the shrubs get rangy or just plain huge. A hard pruning doesn't hurt them but ends up making them grow better. And in the spring and really all growing season, there are invasive plants, also known as weeds. Dandelion and it's late season cousin (the one with the tougher stem), creeping buttercup, holly from the nearby park, and quite a few small plants the names of which I do not know. There is also an abundance of maple seedlings from the sycamore that's as old as the house, and somewhat fewer horse chestnut seedlings from the huge boulevard tree that belongs to the city. I don't want any of these things in my gardens. I don't want them competing for resources or crowding out the natives. So we get down on our knees and dig out the weeds. I was really into the gardening and landscaping for several years. Then when things got fairly well established and there wasn't that much to do other than maintenance, I slacked off a bit. And then I got distracted by other things. The garden suffered. I lost some plants. Some others lost ground to grasses and other invaders. I didn't keep up with the weeding. This year, we seem to be back on track. Sweetie started it with an aggressive weeding campaign earlier in the summer. And recently I have stepped up my own maintenance. The garden is getting back its shape. 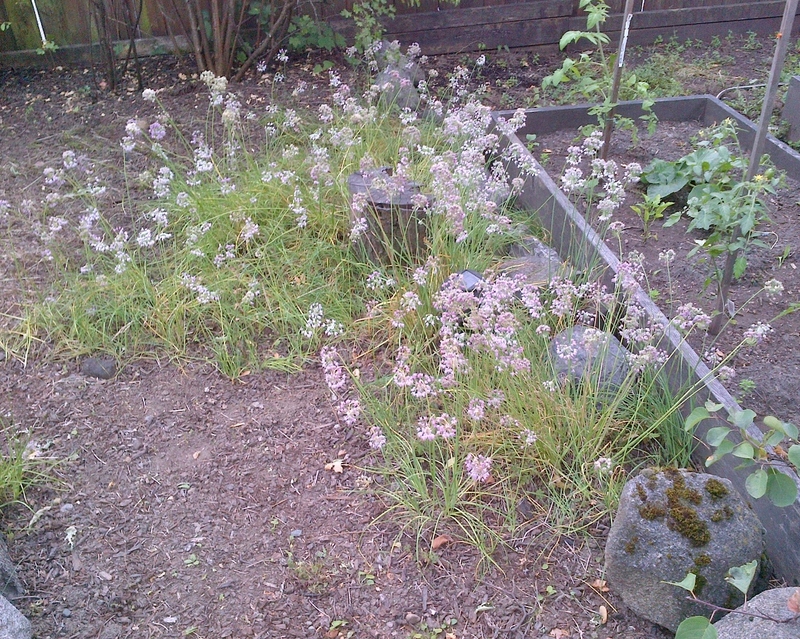 It's a semi-wild garden, but we don't want it to run completely wild. It has its own shape and form. In a lot of ways, it's a silly time of year to get all enthusiastic again. Most of my plants bloom in spring and early summer. At this point, the only flowers left are some ocean spray (slowly browning), nodding onion, bits of penstemon, and some of the non-native succulents in the rock garden. But I still love being up close with my plants. I don't really love the weeding itself. It's tedious and back-breaking. But I'm treating it as habitat rehabilitation. I'm carefully extracting things like grass and buttercup and maple seedlings and allowing the plants I want to have a better chance. I'm being very careful about what I clear, but I find that some of the natives have jumped out of their original locations, especially violet, nodding onion, and strawberry, which goes everywhere. I'm letting some of them stay at least to see if they help keep the weeds down. And they're pretty growing in smaller cluster, sometimes sharing space. Not many people appreciate the garden, but I'm proud of it. I love how I don't have to water it. I love how it's like a mini-wildlife habitat. And sometimes someone visits who understands what I have done. They are pleased and I am gratified. I was on the leading edge in the early 2000s. Now both native plant gardening and xerescaping are starting to go mainstream, especially with many locations under watering restrictions during the summer. I'm glad I'm back to communing with my babies. I think they're happier for it. All these years I was a xerescaper and I didn't know it! Thanks for a new word and glad that I am not alone in letting plants do what they do best. Our yard is gigantic, though. I'd like to set up another bed, coming off the back of our house, and get rid of a lot of grass there, too. We already have a small flowerbed there, we could just enlarge it.